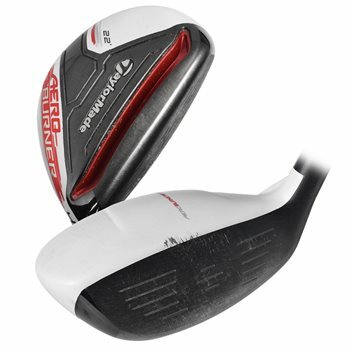 The TaylorMade AeroBurner TP rescues are TaylorMade’s most aerodynamic hybrids ever. They feature a new aerodynamic shape, longer hosel, flatter lie and an open face angle. The new Open Channel Speed Pocket increases the size of the sweet spot and reduces spin. With a new white matte finish, black PVD face and linear AeroBurner crown graphics, the AeroBurner is easy to align up. Several aftermarket shafts and grips are available to customize your AeroBurner.